Synopsis: Sweeny Todd (played by Jonny Depp) in a deep feeling musical. There is alot of gloom, heartbreak, and revenge. All the songs are defining feelings, past and presents happenings, and what the characters are going to do. Flashbacks are a good factor in the mythical story of anger and dispare. 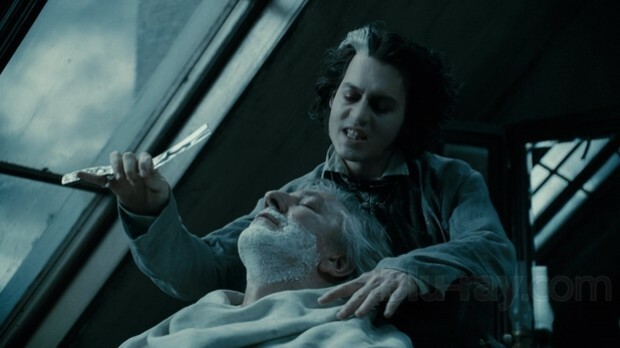 Sweeny Todd is a barber that was wrongly accused of a crime and was exiled out of london. He then returns to kill for revenge against everyone that wronged him in the past. He ends up killing and cooking all victims into meat pies, and watches the towns people devour them with delight. A suprise ending leaves you in awe, and feeling all the pain that Sweeny endured in his life. I thought, Sweeny Todd was a brilliant, well made movie. Tim Burton is genius when it comes to capturing the mood. He has amazing flashbacks, and always picks the perfect cast.